Haha it's true, sometimes real life gets in the way of styled photos. But I like your realistic approach! Cannot wait to try these. So here's a question - have you ever done them with fresh cranberries? I'm thinking of trying this with fresh as I now live in a place where we actually have an abundance of cranberries! I haven't made them with fresh ever, Marilyn, because those are hard to come by most places I've lived. Aren't fresh cranberries quite bitter? Maybe you could chop them up and macerate with sugar first? You'd have to drain them before folding them into the batter, but you could use the sweetened juice instead of some of the milk. And adjust the sugar down to half a cup, perhaps. Thanks, Joanne! Needs must, as they say. Can't go wrong with muffins, Renee. So easy and quick. Hope you enjoy them! STACY! Holy sweet mother of seatbelts, what a terrifying story. I can't even imagine what was going through your head that day. Thank God your family was safe, and thank God for the invention of seat belts! It's such a small thing, putting the seatbelt on every time I get in the car. I do it on autopilot, without even thinking about it. But yes, you're right, it's there to help save my life. Thankfully they did their job with your husband and daughter. As for the biscuits, YUM! I don't have a go-to biscuit recipe so I'm definitely going to try these. SO glad your family survived this horrific accident. A blessing you'll never forget. And your biscuits look terrific! 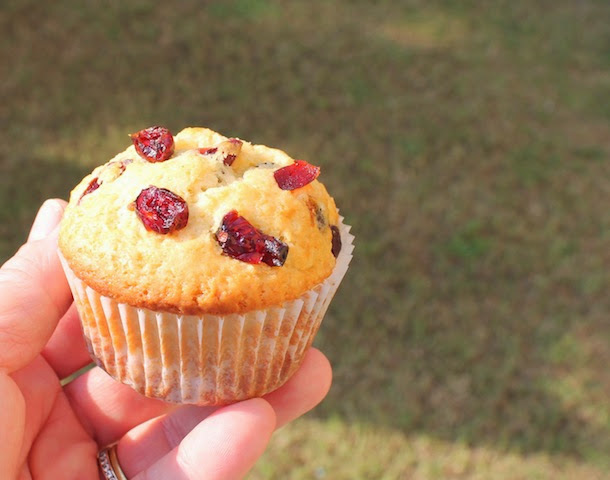 I love cranberry muffins and your look delish!! I LOVE the pic and the recipe looks FAB, too! Oh, my goodness. So relieved you're OK.
Just when I thought that how many more types of muffins can there be, and I see you posting, tweeting and sharing all these delicious recipes from your kitchen and others. Am not a passionate baker, but the pics do make me feel that it's not a very difficult task! 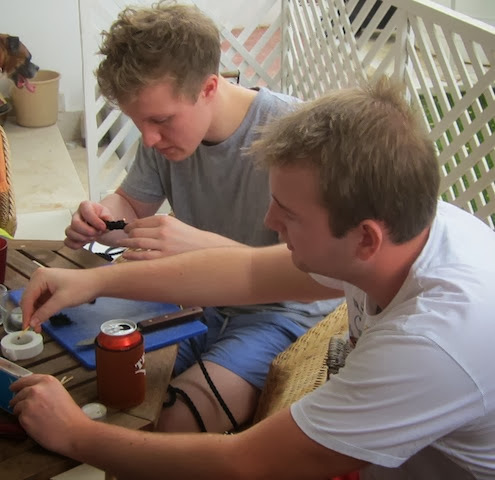 I'd be happier in the kitchen than splicing too! I don't know how you keep coming up with your muffin variations but I love checking in. Jade looks like a gorgeous gal by the way. Oh my. My heart is in my throat seeing pictures and hearing about it after the fact. I can't imagine what it was like when it happened. Your biscuits look delicious. I'm very happy with my recipe but I'm going to try yours soon. I guess any seatbelt is better than no seatbelt, Martin! I thank God every day for keeping us safe. Thank you, Martin. Thank you, Kayle. It was scary! I had to keep calm because I had Cecilie in the car with me and I didn't want to freak her out, but it was hard. I am so glad you have a warm home in the sleet too, Kelli! So many people don't have that. Victoria was fine after, Bea. I don't know that she even realized the import of what happened. We are thankful every single day! Happy Thanksgiving to you and yours as well! So small but so very significant, Shaina! I don't get folks that won't wear them. Happy Thanksgiving to you! I am glad that you shared your story…the biscuits are wonderful, but the story of thankfulness is worth reading. Thank God for seatbelts is right! Beautiful bateau Madame! It reminds me of Britanny, as do your delicious cakes. Thanks, Kelli! There aren't something I grew up with but I love them now. That's why I always do the step-by-step. 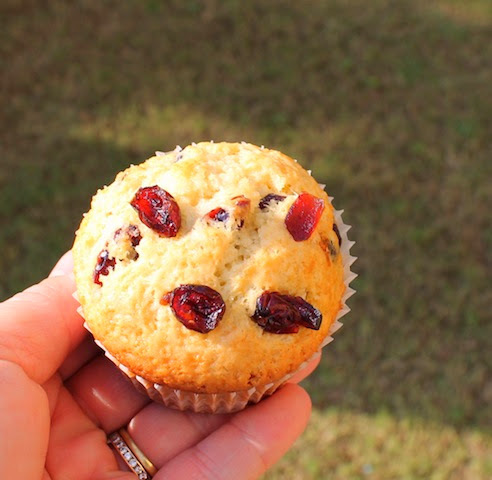 Hope you do try them as muffins are so easy and versatile. You can change out the cranberries for most any fruit or even chocolate chips. Muffins are endlessly versatile, Ishita! And easy! They are great for unenthusiastic bakers. Although I find it hard to believe you aren't enthusiastic about everything kitchen related! Always delighted when you check in, Nancy! 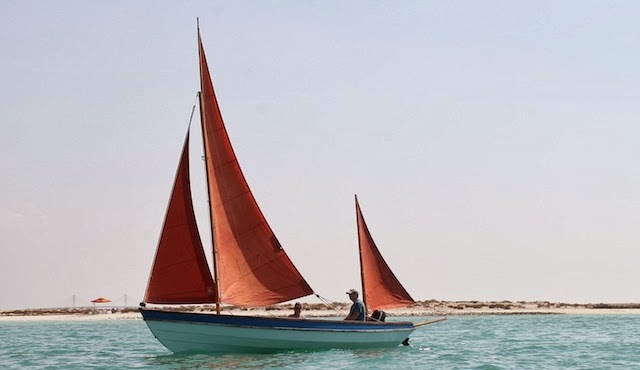 Sailing is one of our favorite ways to spend a weekend day and Jade is a lovely, simple to sail boat. Merci, Monsieur! I'm happy to be able to bring you some good memories. We love Brittany and often cross the channel to spent time there when we are in Jersey. Beautiful coast with beautiful food! If that's home for you, I'm jealous! I am very enthusiastic, as long as I don't have to stick to proportions which is an absolute must in baking! The school program was compulsory and you knew when you enrolled your child there that the expectation was attendance. So I fear you would not have had a choice. The experience and growth was well worth the hardship! Me too, Renee! We always wore them before because of what we had read about their effectiveness. Now we wear them because we KNOW. You are most welcome, Tara. Mix up a batch and freeze them. You'll be glad you did. That's it, Heather. End of story. I just don't get folks who still refuse! Fortunately I approached the car from behind, Courtney, so I saw that they were okay before I saw the damage! These biscuits are the butteriest! Oh, Alice, that is such a tragedy. I am so, so sorry for your family's loss. I can even imagine getting THAT phone call. I know it's a blessing that no one else was injured as well but what a huge hole they have left in your hearts and lives! They are, Lori! I am glad you are here as well! I try to be thankful every day, Sarah, but I hadn't thought about this for a while. My husband still holds it close. He said it was like a nightmare when he suddenly saw the headlights right in front of him, with no way to avoid them. It just didn't compute for a few seconds. Thank you so much for your kind words, Alaiyo! Thanks, Jennifer! I love these biscuits and I am glad you do too. Thank you, Katy! Happy Thanksgiving to you too! They are exactly like a buttery scone! But fluffier. I couldn't have said it better myself. I am still taking name suggestions under consideration, Dorothy. Your vote counts! My goodness Stacy. Really thank goodness for seat belts. When I got my drivers license I was one of those people that insisted everyone where their belt. Oh and lovely biscuits as well! Wow what a moving story! I never made biscuits but you have inspired me! These look fabulous and perfect for this time of year!! !